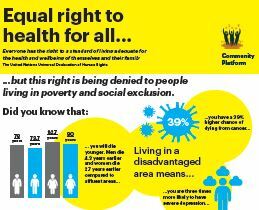 “Everyone has the right to a standard of living adequate for the health and wellbeing of themselves and their family"
The UN Universal Declaration of Human Rights states that “Everyone has the right to a standard of living adequate for the health and wellbeing of themselves and their family”. However, this right is being denied to people living in poverty and social exclusion. The urgent call to address this denial of human rights was made by the Community Platform which today launches its public awareness campaign entitled ‘Equal right to health for all’. On Universal Health Coverage Day, December 12th, the Community Platform, a network of 27 national organisations working together to address poverty and inequality, has produced a leaflet and poster which highlights the worse levels of health for people living in disadvantaged areas and those experiencing poverty, social exclusion and inequality. s You will die younger. Men die 4.3 years earlier and women die 2.7 years earlier compared to affluent areas. s You have a 39% higher chance of dying from cancer. s You are three times more likely to have severe depression.